USS Chicago (CA-136) was a Baltimore class heavy cruiser laid down on 28 July 1943 at Philadelphia, Pennsylvania, USA, by the Philadelphia Navy Yard. Launched on 20 August 1944 she was sponsored by Mrs. Edward J. Kelly, wife of the Mayor of Chicago, Illinois, and commissioned at the Philadelphia Navy Yard on 10 January 1945, Captain Richard R. Hartung, USN, in command. On 1 November 1958, Chicago was reclassified CG-11 and towed to San Francisco Naval Shipyard to begin a five-year conversion to a guided missile cruiser. Begun on 1 July 1959, the entire superstructure was removed and replaced with new aluminum compartments, modernized electronic systems, and an improved Naval Tactical Data System (NTDS) equipped combat information center. Representative of the new technological focus on guided missiles, Chicago was refitted with Tartar and Talos SAM stowage, loading, launching, and guidance systems. Two triple torpedo tubes, an ASROC launcher, two 5 in/38 cal guns, and two antisubmarine helicopters rounded out the cruisers’ modifications. Designed to provide long-range air, surface, and sub-surface defense for task forces, Chicago was recommissioned at the San Francisco Naval Shipyard on 2 May 1964, and was assigned to Cruiser-Destroyer Flotilla Nine, Pacific Fleet. Preliminary acceptance trials were conducted throughout the summer until 2 September, when Chicago officially joined the 1st Fleet as an active unit. Following sonar calibration and deperming in Puget Sound the cruiser arrived at her home port of San Diego, California to begin weapons systems qualifications. Examination and evaluation of the new missile systems were completed by 2 December, following successful trials at the Pacific Missile Range off southern California. On 4 January 1965, the cruiser shifted to Long Beach, California to begin a series of shock tests off San Clemente Island. Equipment tests, as well as damage control exercises, were completed by mid-January. Chicago then departed the area for San Francisco for alterations, receiving upgraded Tartar missile systems and improved electronics. The warship returned to San Diego on 17 April. For the next two months, Chicago continued shakedown training, engineering, navigation, and seamanship drills as well as missile and electronic exercises. In mid-June, the cruiser began Talos fire control developmental testing with the Naval Electronics Laboratory. This, and later tests, examined guidance improvements and experimented with missile replenishment at sea. During fleet exercise "Hot Stove" in August–September, Chicago practiced anti-air and ASW operations, including firing ASROC and tube-launched torpedoes against submerged "enemy" submarines. Following an ECM exercise Chicagoparticipated in a competitive missile firing exercise and won a gold Missilery "E" for her Tartar battery. During the first week of October the warship participated in another anti-air exercise, this time shooting down two high-speed, high-altitude drones with Talos and Tartar missiles. After a cruise to Hawaii from 19 October to 3 November, during which the cruiser practiced tactical data sharing training with Kitty Hawk and Mahan, the ship finished out the year conducting tests and exercises in the San Diego area. Local operations continued in the spring, including more missile evaluation tests through February 1966. Returning to San Diego on 4 March the ship underwent operational readiness, technical proficiency, boiler, electronics, and nuclear warfare acceptance inspections. In April, the warship participated in Exercise "Gray Ghost," where the cruiser operated as tactical flagship for the anti-air warfare commander, Rear Admiral Elmo R. Zumwalt, Jr..
She completed five Vietnam deployments was finally decommissioned in 1980 and scrapped in 1991. Cyber Hobby adds to their growing list of US guided missile cruisers with this one of the USS Chicago, probably the best know ship of its class after the nuclear powered USS Long Beach. 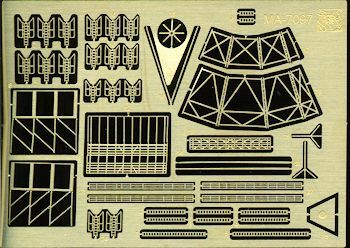 With a career that spans from WWII into Vietnam and beyond, it is about time that someone kitted this ship in the sort of detail that modern injected plastic can provide. The instructions are typical of Cyber Hobby/Dragon and provide Gunze along with Model Master paint references. 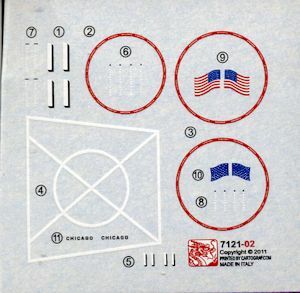 The decal sheet that accompanies the kit (darkened to show the white) is well printed and in register. 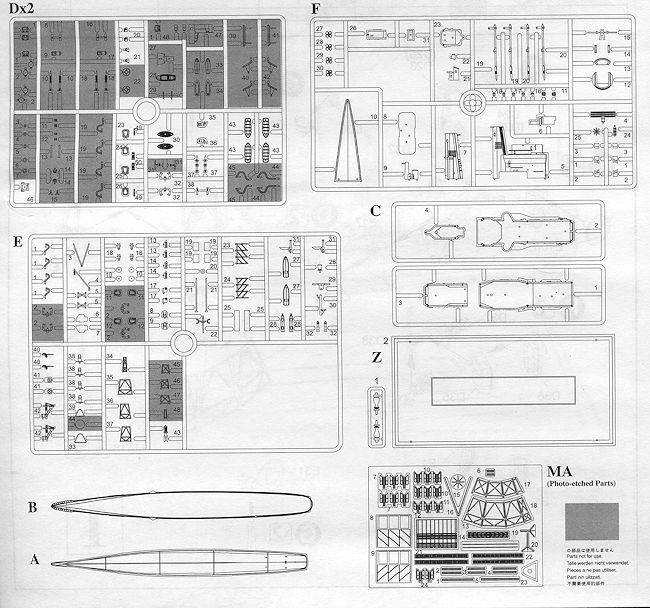 You now have another fine guided missile cruiser to add to the growing catalogue of these ship types produced by Dragon/Cyber-Hobby in this scale. Thanks to www.dragonmodelsusa.com for the preview kit If you would like your product reviewed fairly and fairly quickly, please contact the editor or see other details in the Note to Contributors.